We are in the midst of a Cult of Youth; it follows therefore that any vaguely talented individual who dies before the age of, let’s say forty, is going to attract some degree of interest, the inspiration for which is often a mixture of sentimentality and opportunism. But Guido Cantelli was – is – a very special case. Toscanini had spotted him at La Scala in the late 1940s and immediately invited him to come and conduct the NBC Symphony Orchestra in the USA, which proved to be a great success. He returned to America to conduct a number of concerts with the New York Philharmonic Symphony Orchestra; these were recorded and form the basis of these Pristine recordings. 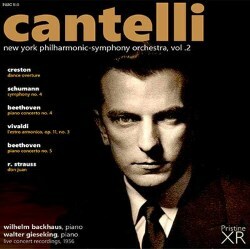 Shortly after the concert enshrined here on CD2, it was announced that Cantelli had been appointed as the next musical director of La Scala; but of course he never took up the post because of his death in a plane crash in Paris in 1956. Volume 1 was published a few months back; and here is Volume 2, with music by Schumann Beethoven, Vivaldi, Richard Strauss – and Paul Creston. Paul who? you might well ask! But Creston was a highly-rated American composer of Italian parentage who composed six symphonies and a large number of orchestral, choral and chamber works. The Dance Overture is a mature work from 1954, and, judging from the couple of hearings I have managed, it’s a pity his work is so little known and performed this side of the Atlantic. It’s a bustling, rhythmic piece, which builds up to a very exciting conclusion. Backhaus’s performance of Beethoven’s 4th Concerto is, as one would expect, immensely worth hearing; strongly characterised, full of poetry. The sound, though hardly ‘modern’ is perfectly acceptable given the circumstances, and has been sensitively cleaned up for Pristine – as have all these tracks – by Andrew Rose. CD2 begins with a Vivaldi Concerto from L’Estro Armonico, his set of twelve string concertos published in 1711. This D minor work is a beauty, but inevitably this version is about as far removed from period performance as it’s possible to imagine. The opening Allegro is ponderous, with the full string section of the NYPSO in action. And the ensemble is none too good either – for a moment there is a serious chance of upper strings and basses losing touch catastrophically. But they survive, though these tracks should be best approached as of historical interest only! That emphatically does not apply to the remainder of the disc. Another keyboard giant of the mid-twentieth century, Walter Gieseking, is in residence for the 5th Concerto of Beethoven. And although he makes a bit of a Horlicks of his first entry, this is a muscular and wholly authoritative account of the great Emperor Concerto. Gieseking’s majesty is fully matched by the grandeur of the orchestral playing under Cantelli – the first orchestral tutti of the Allegro will demonstrate that straight away. There are a few awkward corners, but, as with the Backhaus 4th Concerto, one is in the hands of great musicians who have an instinctive understanding of each other’s approach to the music. The final track brings us Richard Strauss’s early tone-poem Don Juan. This is where Cantelli truly comes into his own on these discs; despite a slightly dozy start from the wind sections, this develops into a sensational performance, passionate and thrillingly physical. You can feel the excitement pulsing through the orchestra, with all sections contributing superbly; brilliant brass, sumptuous strings, and wonderfully expressive wood-wind solos. But above all, one responds to Cantelli’s flawless pacing of the work, allowing all details to take their place in the summative impact. Pity the audience weren’t really equal to all this; someone starts clapping in the unlikeliest place, and, as far as I can tell, the last pizzicato notes of the work are obscured by the burst of applause! Not to worry; this is a precious record of a true great among conductors in the making, and a reminder of the genuine tragedy of his early death.